One of my favorite films from Fantastic Fest 2010 was a little horror flick from up and comer Chris Peckover entitled Undocumented. The film, very much grounded in some of the real life social horrors our country is experiencing, focuses on some young filmmakers as they follow undocumented illegal immigrants crossing the border from Mexico into the U.S. in hopes of a better life. That's when things go horribly wrong, as both groups are kidnapped and tortured by a group of American extremists, led by the villainous Peter Stormare (Fargo, Big Lebowski). And now we have a bloody star-spangled poster below! What a poster! I'd salute that…the design…not the message…you know what I mean. One thing is for sure; it is definitely an improvement over the initial teaser poster for the film, which riffed on the instantly iconic design from The Social Network poster (a poster trend that was stale as soon as it started). According to Undocumented producer Keith Calder, via his Twitter, this poster was designed by New York-based graphic designer Laz Marquez, who has done some professional TV & film design in the past, along with his own minimalistic takes on classic films (such as a beautiful Hitchcock series that you must check out). Co-written by the director and Joe Peterson, Undocumented also stars Scott Mechlowicz (Eurotrip, Mean Creek), Kevin Weisman (Clerks II), and Noah Segan (Looper, Brothers Bloom, Brick). IFC Midnight will release the film this weekend at IFC Center in New York before it hits VOD the following weekend. Lucky for you I like going home! This looks rather interesting. Hmm, the news always tells a different story. I am not sure if you are being sarcastic or not.. But if wanting ILLEGAL persons in this country to go back where they came from, not being a drain and strain on our economic/social liberties and a burden to all the other immigrants who come here legally, then I guess I am an American Nazi.. End rant.. I dont want to turn this into a political debate, but your post struck a nerve. If you don't want to turn this into a political debate, Kannibal, than too damn bad, you opened your big mouth!! Typical ARROGANT American talking about "they" should go back to where "they" came from. Have you NEVER taken a history lesson? "They" are indigenous to this continent, not you!! The so called "drain and strain', as you call them, pick our fruit, build our houses and work in our restaurants because we think we're too damn good to do anything but sit in front of a computer and make way more than we deserve. You struck a nerve, too. Radical right wing bad guys. How edgy and original. Yeah, because they NEVER demonize liberals, right? Get over yourself. America's cool, I wish all these Pinkos would realise that and stop making movies saying it's not. Pinkos? The 1970's called and they want their word back. You must be a Commie spy! At first glance it was awesome... then I realized how dumb the execution was. 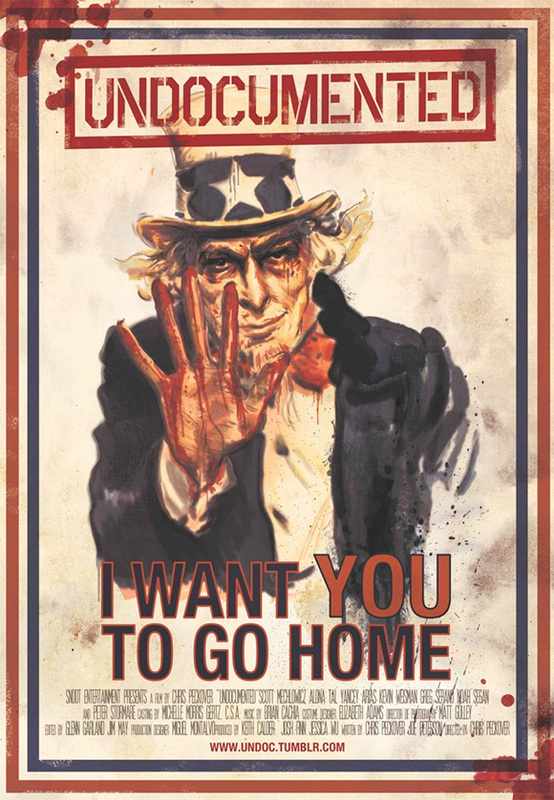 The whole "I WANT YOU" part of the orinal poster was emphasized by the finger pointing at the viewer, which made the original such an iconic (and somewhat infamous) poster. And this one seems to say "Give your old drunk uncle (sam) a high-five for cutting his hand open on broken beer glass!". His hand is held up to signify "Stop", at least that's how I took it. That poster says all it needs to. Piss off home. We don't want you here. The film will bgecome a valuable social document and how-to guide when it come to dealing with illegals, and the traitors who support them. THIS MOVIE WAS VERY DISTURBING. THE IRONY IS THAT IT IS ALL TOO FAMILIAR OUT WEST AND POSSIBLE . WORSE YET, IS THAT MOST COUNTRIES THAT BORDER THE U.S. AT ONE TIME WERE MEXICAN OWNED TERRITORY . I WATCHED THE MOVIE TWICE. IT WAS SO MIND BENDING. THE HATE OF RACISM WAS PALPABLE. THE CAST OF CHARACTERS REPRESENTED SEVERAL SEGMENTS OF THE POPULATION WE FIND IN THE U.S. TODAY. FROM THE RACIST HATERS TO THE IGNORANT WHO HATE BECAUSE THEY NEED MEMBERSHIP INTO A CLUB THAT REQUIRES NOTHING MORE OF ITS MEMBERS THAN TO DEHUMANIZE OTHERS TO FEEL BETTER THAN. INCLUDED ARE EVEN THE MEXICANS WHO DO NOT IDENTIFY AS SUCH AND PERSECUTE THEIR OWN DUE TO SOME SENSE OF SELF ELEVATION BECAUSE THEY HAVE LEGAL RESIDENCY IN THE U.S.. I HAVE MET THOSE IN REAL LIFE. THEY ARE THE LIGHTER SKIN ECONOMICALLY WELL OFF ARTURO'S THAT INSIST THEY BE CALLED "ART" AND NEVER HEARD OF SPANISH AS A SPOKEN LANGUAGE. VERY THOUGHT PROVOKING!!!!! A MUST WATCH REGARDLESS OF YOUR SENTIMENT REGARDING IMMIGRATION. CORRECTION " MANY U.S. STATES THAT BORDER MEXICO, WERE ONCE MEXICAN OWNED TERRITORY". Someone has to let me know why this film is marked so "blood soaked". I'm usually not a wuss when it comes to gore films, but lord, the reviews I have read are insane. Now is it like "I'mma rip ur heart out and eat it in front of you and fry ur brains for breakfast" gory, or is it more the psychological aspect that makes it so disturbing? THROW ME A FRIGGIN BONE HERE.